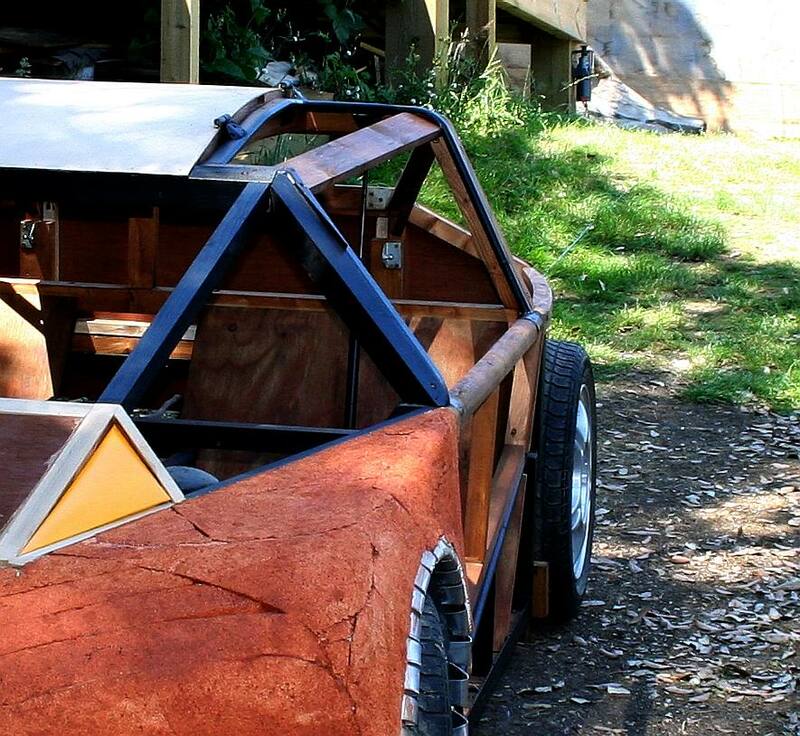 TRIBUTE - This nippy little electric sports car was produced in the workshops at Herstmonceux Museum. It is the only road car to (legally) bear the famous blue bird legend that is a registered trademark to protect against imitations of the cartridge exchange system and other design features. Incomplete at the moment, the car will be on virtual display to the public in the future as will Campbell Hall; a 'virtual' hall of fame. Following the LSR fiasco, and with the dust settled, the Ecostar DC50 was born. The little gem of a city sports car is the direct descendant of its electric racing cousins. It is not a paper exercise like other pretenders to the EV throne that abound. It is a real project with something tangible to show for the input of the many contributors and volunteers - and yes it drives when assembled - where at the moment the motors and other parts are kept locked away separately to the portable display case for security purposes and to prevent corrosion while not in use. So, high hopes for the future of the brand that inspired so many generations of engineers. We must learn from the past to be able to plan for the future - and that is why museums like ours are so important culturally and socially. Herstmonceux Museum is one of the smallest in the UK, potentially qualifying for a Guinness Book World Record one day. 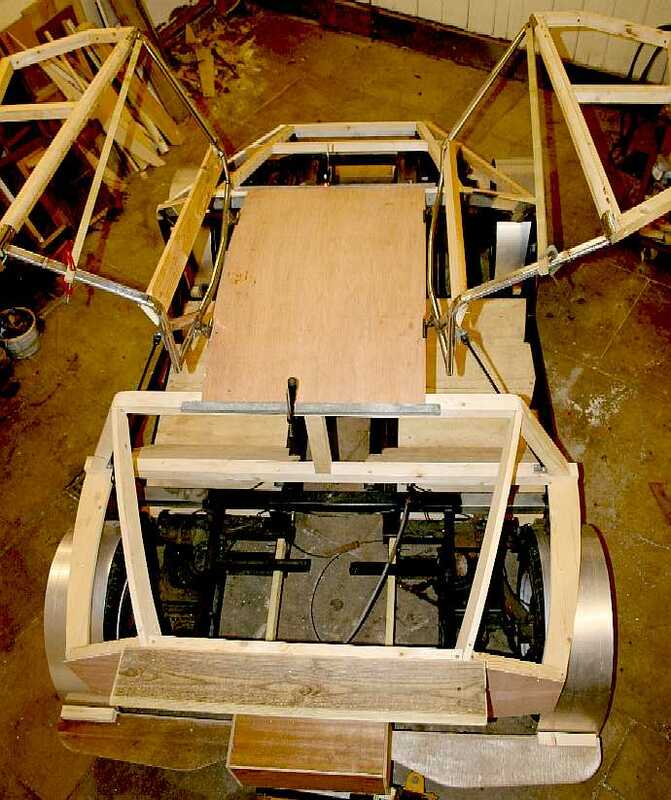 BE4 WOODEN FRAME - The bodywork, or more correctly, the buck, is made from ordinary softwood with some plywood panels. The same foam system is used as the formers for carbon fibre or other composite panels. The timber needs to be liberally treated with a good quality (Ronseal) wood preserver before being painted and ready for display. 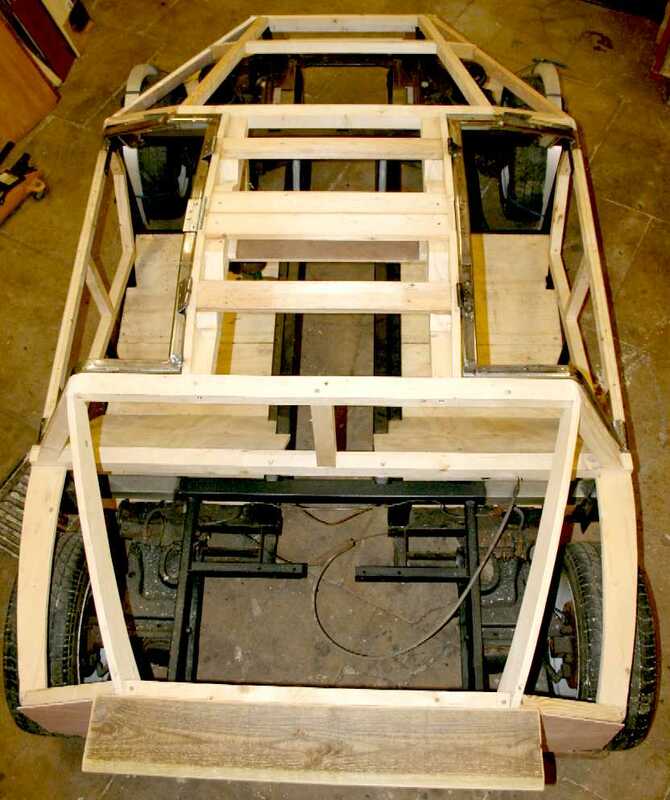 The idea is that when our volunteer Trustees have the time, that some of the key parts of this vehicle, such as the body moldings, are completed and fitted. 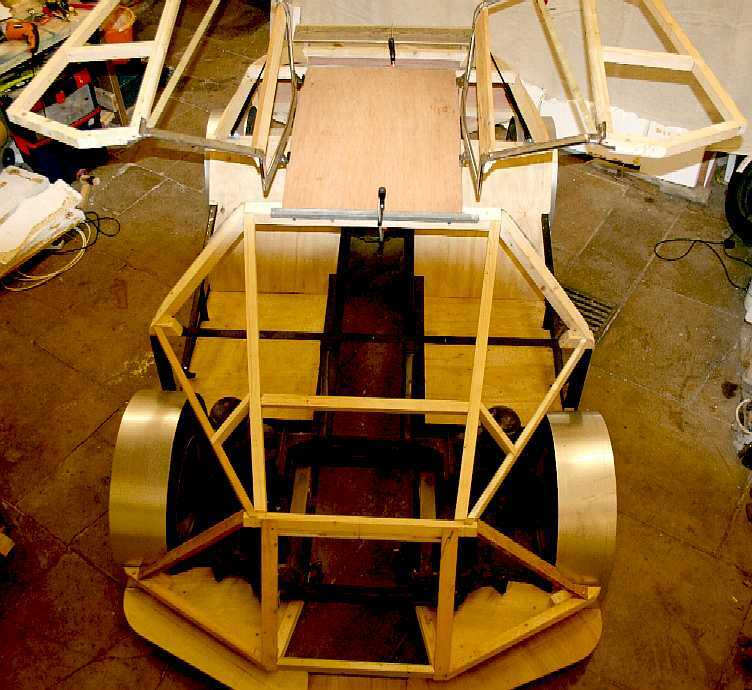 The car is fitted with 48 volt Lynch motors at the moment, powered by lithium batteries and controlled via a Curtiss speed controller. If funding had been available, the car would have been fitted with 50kW wheel motors, one per wheel - making this a 270 horsepower wolf in sheep's clothing. GULL WING DOORS - One of the key features of this stunning small car is the "gull-wing" doors. 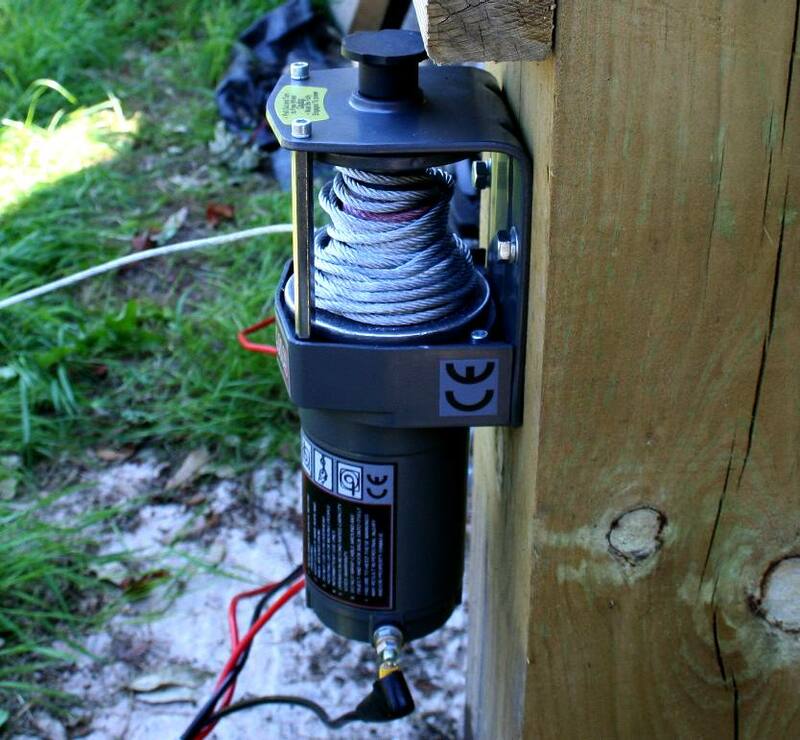 They open using gas struts and are manually closed. Gull wing doors allow easier access for the drivers of very low vehicle, but are only seen on more exotic cars and custom vehicles because of the design complexities and additional cost of production. A BLUE BIRD AT REST - The rear of this car sports two wings, one on the boot lid and one just a few inches above the road to induce laminar exit airflow. 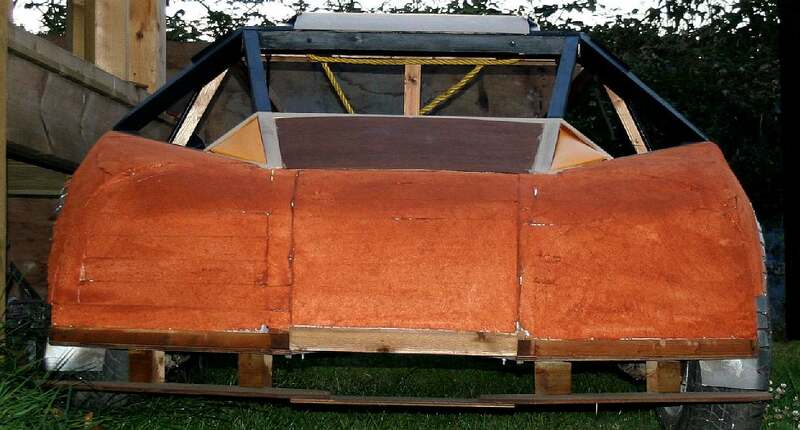 The back-pack seen here will be incorporated into the bodywork that has yet to be sculpted from foam - where foam is added when the shaping stage is reached. The rear arches will also blend into the tail of the car. It should be a pleasing combination. At the moment we can see a hint of Lamborghini Countach in the styling. We also need to see some lights please. LED of course. Copyright photograph © 20 August 2017. You will need the permission of Lime Park Heritage Trust to be able to use this picture, except for educational use and private study. ON ICE - Jack Frost creeps in occasionally to create these wonderful winter cob webs that unfortunately a photograph cannot capture. Copyright photograph © January 2018. You will need the permission of Lime Park Heritage Trust to be able to use this picture, except for educational use and private study. WINTER SNOW 2018 - The Donald Campbell special is seen here braving the elements rather well in its polycarbonate case. The temperature reached minus 5 degrees at one point in February at night time and minus 3 degrees a few days later in March during the day. 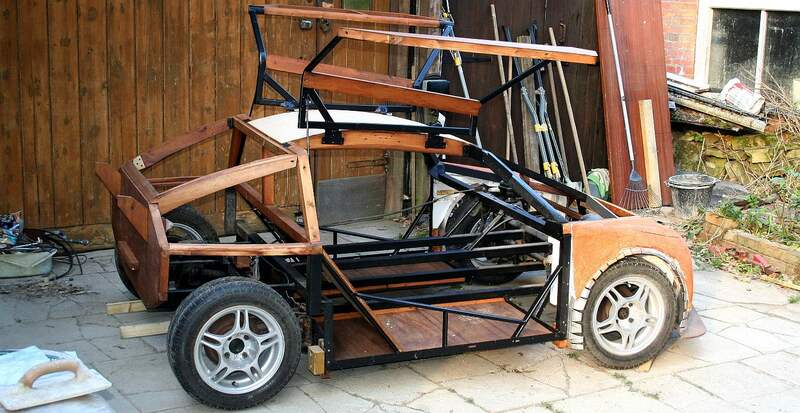 One day this vehicle or a derivative of it, may be a STEM project. We are sure that Lord Nuffield would approve. Lord Nuffield is William Morris famous for the Morris Minor and MG cars. 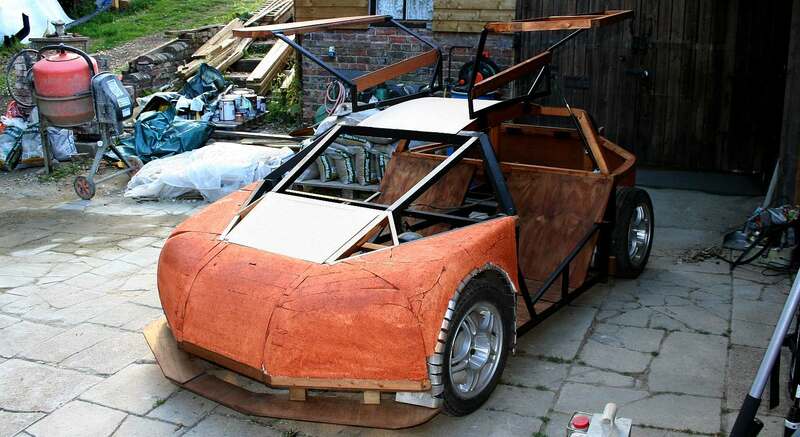 The running gear for this vehicle is in part sourced from Morris parts. Copyright photograph © 27 February 2018. You will need the permission of Lime Park Heritage Trust to be able to use this picture, except for educational use and private study. Herstmonceux Museum, including Campbell Hall, is run by the Lime Park Heritage Trust and other not for profit concerns. The plans to admit the public to the site have been abandoned because of the additional administrative burdens and cost where Wealden District Council are not cooperating to help us allow access, but are rather hindering progress, not unusual, as many local businesses and farmers will agree. We recall the case of the soldier helped by common sense crusaders Noel Edmonds and Keith Chegwin, with backing from Gordon Brown and David Cameron - and an 8,000 strong petition that was generated where public feeling was so strong. GULL WING - This incredibly compact electric cars features gullwing doors and when fully loaded, four wheel drive and 300hp (200kW), making it potentially one of the fastest electric road cars. 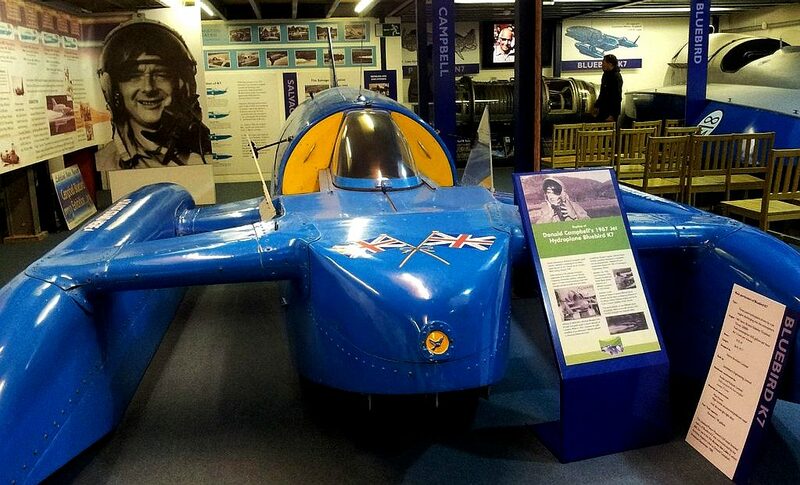 It was designed to commemorate the 50th anniversary of Donald Campbell's land and water speed records in 1964. Copyright photograph © July 5 February 2017. You will need the permission of the Lime Park Heritage Trust to be able to use these pictures, except for educational use and private study. DESIGN INFLUENCES - The front end reminds us of a modern Bugatti. Copyright photograph © July 5 February 2017. You will need the permission of the Lime Park Heritage Trust to be able to use these pictures, except for educational use and private study. UNFINISHED ART - The car was winched up a hill to its display case, using a 12 volt automotive bumper winch designed for off road vehicles. As seen here the DC50 woodwork is protected with preservative, the foam is sealed with a water based preservative, while the metal parts are coated in a propriety rust proofer. 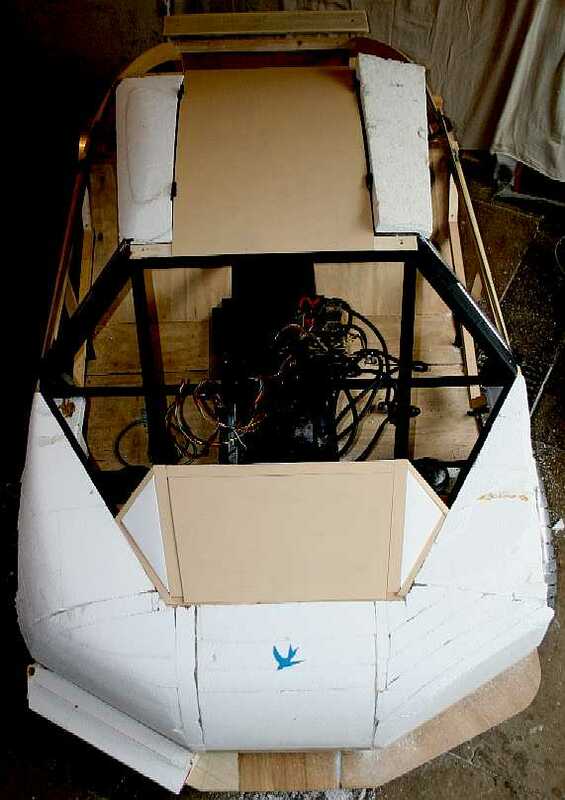 The car will have to wait until the engineers who built her find the backing to complete the carbon fibre bodywork. The running gear is stored in a controlled environment elsewhere. Copyright photographs © July 8 February 2017. You will need the permission of the Lime Park Heritage Trust to be able to use these pictures, except for educational use and private study. TILT DISPLAY - The ultimate security device. The whole display case tilts open to allow the DC50 under the portable car port. This feature alone is likely to foil any attempt by thieves to steal the car. Copyright photograph © July 31 February 2017. You will need the permission of Lime Park Heritage Trust to be able to use this picture, except for educational use and private study. HEAD-HEIGHT APLENTY - This little electric beauty rolled into its protective case with room to spare. the lifting mechanism will be hydraulically operated from this point on. Security cameras and lighting will add to the display. Copyright photograph © July 31 February 2017. You will need the permission of Lime Park Heritage Trust to be able to use this picture, except for educational use and private study. OPEN SESAME - Like Aladdin's cave the tilt display case opens on command to reveal an electric treasure inside. Copyright photograph © July 31 February 2017. You will need the permission of Lime Park Heritage Trust to be able to use this picture, except for educational use and private study. SECURED - All tucked away. Next comes the roof and glazing followed by the hydraulic lifters. Copyright photograph © July 31 February 2017. You will need the permission of Lime Park Heritage Trust to be able to use this picture, except for educational use and private study. WEATHER PROOFING - A shallow pitch roof was decided as a compromise where we did not want the display case to be obtrusive or too heavy to lift just in case the hydraulics might be out of commission for any reason. Copyright photograph © 9 August 2017. You will need the permission of Lime Park Heritage Trust to be able to use this picture, except for educational use and private study. SOLAR CAR PARK - When this fine looking sports car comes out again to play, it is on the cards that the carbon fibre body will incorporate three solar panel areas on the roof, boot and bonnet. The parking bay is also set to feature solar panels on the roof, to provide extra charging while the vehicle is under cover, so helping to reduce climate change. 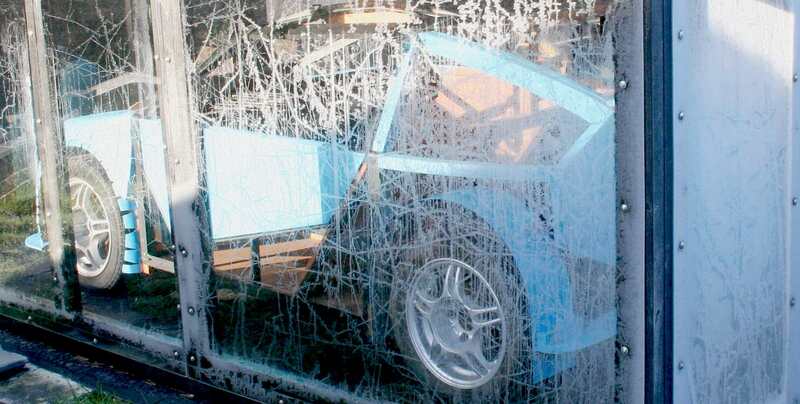 The blue paint seen here is temporary and only to prevent mould while in storage. Copyright photograph © 20 August 2017. You will need the permission of Lime Park Heritage Trust to be able to use this picture, except for educational use and private study. GLASS CASE - Not quite, but very strong and just as clear. Architectural grade polycarbonate is used to encase the electric city sports car, the first road car to be fitted with an inbuilt battery cartridge exchange system to be able to self-service and recharge instantly. Copyright photograph © 24 August 2017. You will need the permission of Lime Park Heritage Trust to be able to use this picture, except for educational use and private study. REFLECTIONS - You can see the a photographer taking a picture in the reflection is the display case. Copyright photograph © 24 August 2017. You will need the permission of Lime Park Heritage Trust to be able to use this picture, except for educational use and private study. SPORTY CAR - The top speed of this car can be as high as 220mph, or as sedate as 90mph depending on the motors specified. Copyright photograph © 24 August 2017. The group that built this car have no connection to the famous Campbell racing family other than the name Bluebird and the blue bird logo that was inspired by Donald Campbell CBE. You will need the permission of Lime Park Heritage Trust to be able to use this picture, except for educational use and private study. 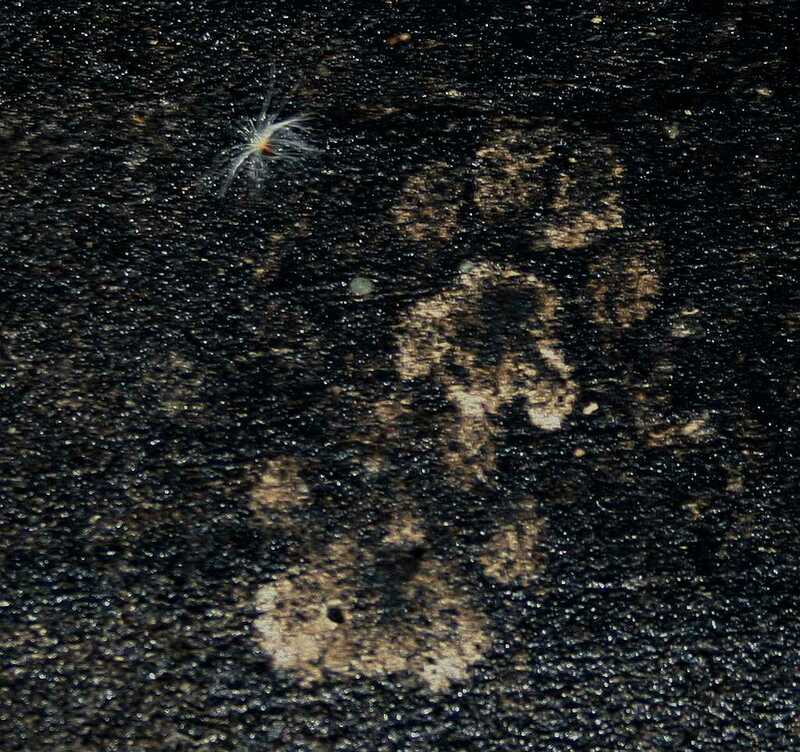 PAW PRINTS - An inquisitive feline did not realize that her investigation of the car port would be recorded. 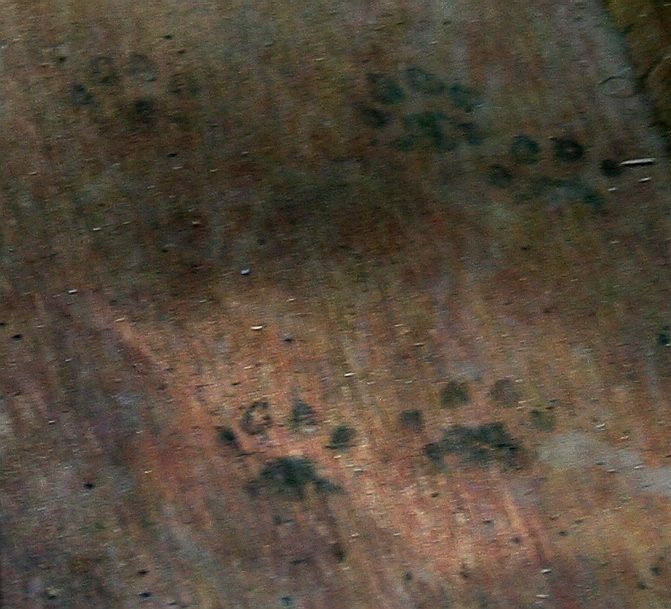 A neighbours cat called Mona, left her prints on the plywood floorpan of the Ecostar, after she put her feet into black sealant on her way onto the passenger seat. Copyright photograph © 24 August 2017. You will need the permission of Lime Park Heritage Trust to be able to use this picture, except for educational use and private study. REPLICA K7 - A superb re-creation of the Bluebird K7 that Donald Campbell raced in Australia on Lake Dumbleyung and in the Lake District, UK. This exhibit is at the Lakeland Motor Museum, Old Blue Mill, Backbarrow LA12 8TA, England according to Trip Advisor. CAMPBELL, CALIFORNIA USA - You can see vintage cars (above), canneries, home life and more at the Campbell Historical Museum in California. According to reviews on Trip Advisor it is a very good local museum on the history of Campbell canning. There are displays when Campbell was mainly a fruit orchard and cannery area. 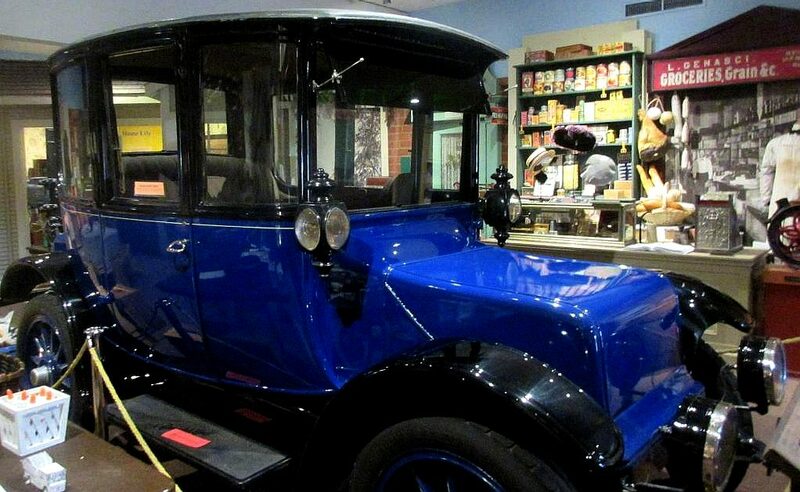 There is the 1921 Ranch and a Lang Electric Coach. SUNSET - February 2017, these plastic screens were the splash guards for the stage performances of the Smooth Faced Gentlemen for their production of Titus Andronicus, when the all female cast liberally spread blood (food dye) all over each other in the graphic re-telling of this most tragic play by William Shakespeare. STACKED - February 2017, the much traveled plastic screens were cleaned down to remove all of the hinges and other quick release catches that actors use for fast set up and scene changes. Then the corrugated plastic was removed (for other recycling) and the nails taken out. With the high cost of skilled labour, it is quicker and cheaper to use new timber, that is perhaps treated. That philosophy goes against the grain for conservationists like our Trustees. 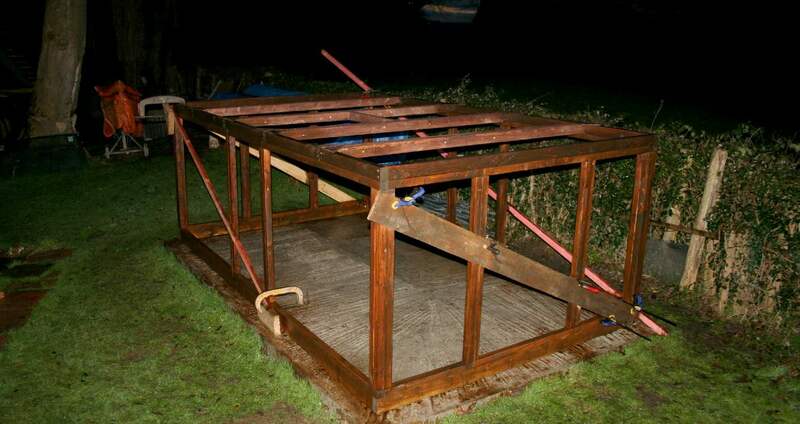 Our friends in Eastbourne provided the base timber, where this frame is transportable and needed something. We can always rely on Stamco for quality timber and a speedy delivery service. CLAMPS - Trying our best to make the irregular, regular. 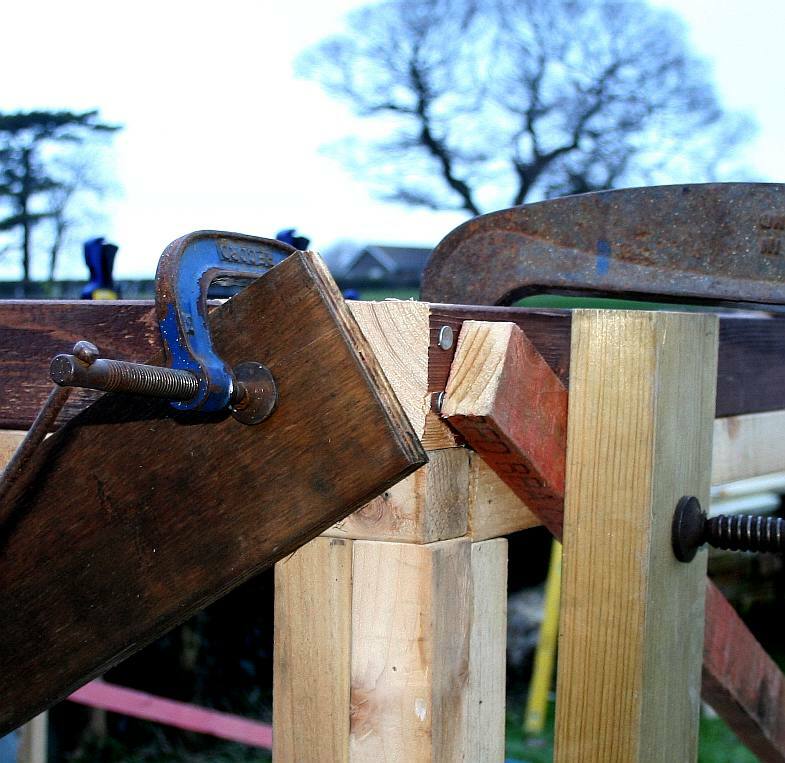 Recycled timber can sometimes require a little extra lining up using clamps. Once reasonably square, galvanized nails are used to join the old stage frames together with some additional carpentry to make this bespoke conversion fit snugly around the exhibit. TRIANGULATION - It is important to get a display case like this as upright and square as possible. 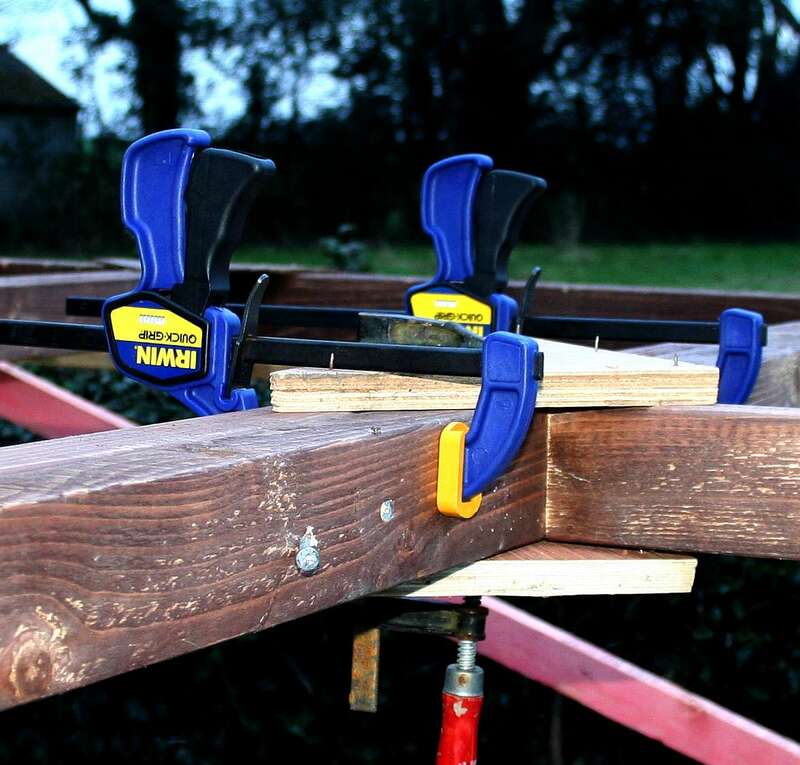 Use planks and other timber lengths with multiple clamps to get one corner straight using a spirit level. Work from the one upright corner to the next and then the next repeating the process, until the frame is square. 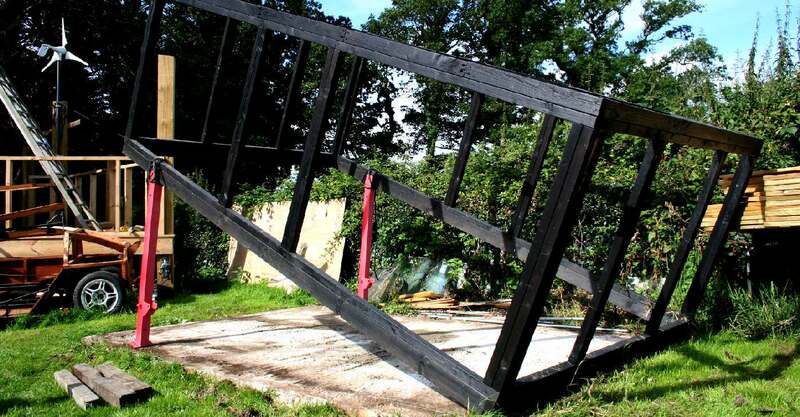 It was more difficult use pre-made frames where the carpenter had no control over how accurate these frames were. Fortunately, they were not too bad. Copyright photographs © February 2017. You will need the permission of the Lime Park Heritage Trust to be able to use these pictures, except for educational and use and private study. DUSK AGAIN - February 2017 was a wet winter in Sussex. In years gone by this slope would have been covered in snow at this time of the year. Climate change is to blame for sure with man burning fossil fuels at an alarming rate, rearing livestock and crops that produce methane. It is not just meat production that is to blame, more carbon dioxide in the atmosphere and rising temperatures cause rice agriculture to release more of the potent greenhouse gas methane (CH4) for each kilogram of rice it produces according to relatively recent research from 2012. The problem stems from population growth. The more people on planet earth, the more food we need and land to grow crops. But just how many people can our ecosystems sustain without causing irreversible extinctions, rising seas and eventually, conflict from rising tensions. Food security is likely to be one of the major issues from 2020. It is already on the UN's agenda along with blue growth, that aims to feed the world from our oceans. DUSK YET AGAIN - February 2017. Drizzle was coming down slowly enough to allow a coat of wood preservative to be applied. We used a formula that prevents wet and dry rot and protects against woodworm. The frame still needs some work, but will eventually be painted satin black and fitted with glass. For now a temporary covering of UV stabilized polythene will have to suffice. Another coat of preservative was applied the next morning. PAINTING - When painting it is important that the wood is clean and grease free. There are now some fantastic garden paints, a slight improvement on masonry paint, though both are designed to be used outside with up to 15 years of protection in between re-painting. Here the frame still needs to be primed on the inside and undersides. Copyright photograph © 17 February 2017. You will need the permission of the Lime Park Heritage Trust to be able to use these pictures, except for educational and use and private study. PORTABLE - With the first coat of paint dry, the next item to sort is the wheels and the hydraulic lift. This is to be a portable display case that is transportable for shows and other events rather than a static display. Copyright photograph © 23 February 2017. You will need the permission of the Lime Park Heritage Trust to be able to use these pictures, except for educational and use and private study.